Barrhaven Businesses Love our B2Bs! Managing the challenges that come with running a small business in Barrhaven is no easy feat. The new B2B workshop series developed by the BBIA allows me to network and learn alongside other like-minded business managers. I encourage other Barrhaven businesses to attend, join the conversation and gain the valuable information these varied workshops provide. I have attended 2 of the B2B sessions offered by the Barrhaven BIA and found both extremely informative. Being a small business owner there are so many hats that I have to wear and it is impossible to have expertise in all functions of my business. 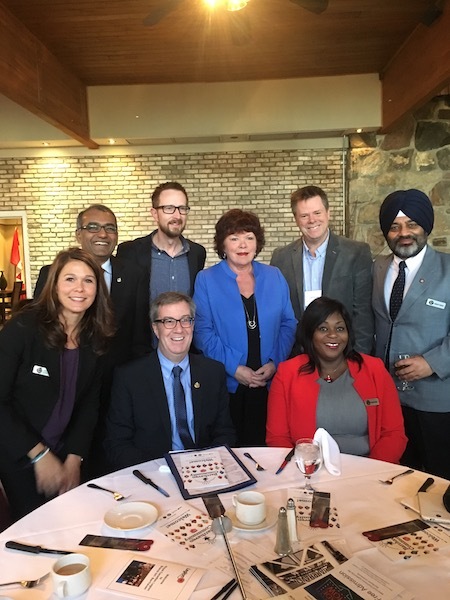 The B2B sessions have given me useful information as well as an opportunity to hear from other members of the Barrhaven business community who have similar challenges. If there is a session that is relevant to your business I would highly recommend taking the time to attend – it will be time well spent! Being in the workshop surrounded by other business owners and operators not only helped us connect with one another, but also it opened our eyes to a different prospective on how to view certain best practices in our company’s operations. Looking forward for more workshops to come! Janet is self-employed and for many years has hired, coached and fired (yes fired!)staff. Janet ‘gets it’ and wants share what she has learned. Please join her, because if you understand ‘business lonely’ this is for you. B2B workshops are open to BBIA member businesses only. Register here. 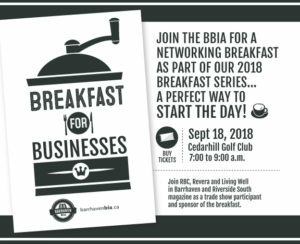 ALL commercial property owners, retailers and professional service providers in Barrhaven are members of the Barrhaven BIA. Do you have questions about your membership? Are you a licensed, home-based business wanting to become more involved with the local business community? We offer home-based memberships as well. Understanding how to target your local customers online can be a confusing and frustrating process for the average business owner. Digital marketing companies solicit you every single day with various solutions and it becomes increasingly difficult to identify what services are a fit for your business and what is a waste of your time and money. Join us on February 27th, where Mark Dickie, partner in 20/eight DIGITAL will help you understand the digital language that is important to your Barrhaven business. Find out how different digital media and channels such as Google, Facebook, Instagram, email marketing and others fit together and how you can leverage these to keep the conversation going with your local customers. Come to the session with your questions, enjoy a light lunch, and leave armed with the tools you need to challenge your own digital strategy and get maximum impact on your bottom line. In this workshop, we de-mystify the process of setting up an online store on the Shopify ecommerce platform, as well as tackling some basics of the Shopify POS system. Greg Boyle from High Peaks Consulting, a Shopify partner, will cover the basics of the platform, how to add products, theme your site, explore app integrations, and publish it to the web. Plus there will be a chance to “Stump the Chump” and ask any and all questions you may have about Shopify, Ecommerce and more! 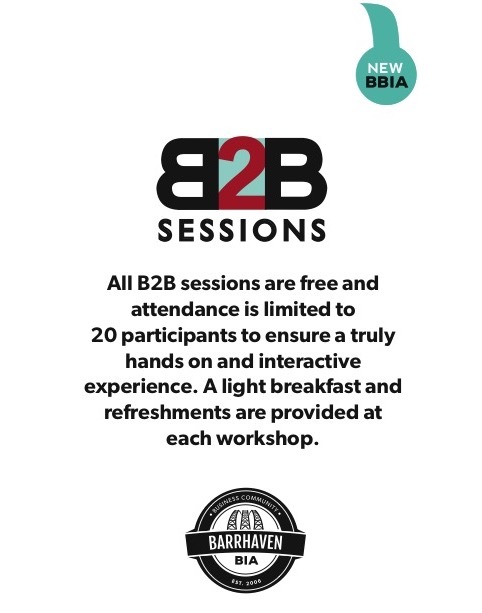 Join us for our inaugural B2B session! Most business owners will tell you that their three greatest challenges have to do with time, money and people. They’re working too many hours for too little pay; cash flow is tight; and it’s hard to find and keep the right people. On October 11th, Rob Dale from Rhapsody Strategies will offer practical training on how to solve these challenges. You will learn the importance of creating an accountability chart that highlights all of the functions of your business and provides clarity around how to assign them to maximize efficiently. Register here for FREE today– space is limited to the first 20 registrants. At our September 2018 breakfast we learned about the four keys to creating a culture of success for your business. One of the most misunderstood elements of a company’s structure is it’s culture. Some believe culture is only relevant when there are employees involved. Some believe culture happens organically and it’s not something you can have much control over. Every company, large or small, has a culture. And while the culture will develop organically if left alone, creating a culture that drives success and keeps everyone focused and moving in the same direction requires planning and energy. A defined company culture impacts the delivery of product and services, so even solopreneurs must take the time to create the culture that best expresses their business. For those with employees, defining culture is even more critical. It provides clarity around purpose and a deep sense of team. Many thanks to Rob Dale from Rhapsody Strategies for his insight and expertise. Contact us for a copy of the presentation. 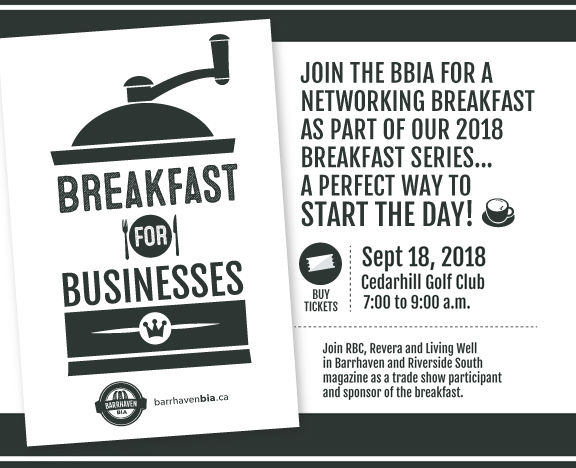 Thanks to our trade show sponsors; RBC, Rivera, Brokerlink, Ottawa Plumbing and Heating, Nepean, Rideau, Osgoode Community Resource Centre, Barrhaven Independent and Living Well in Barrhaven Magazine. A heartfelt thank you to all of our event sponsors and to all who attended the breakfast. This year, we proudly raised $20,000 for the Ottawa Heart Institute. As February was Heart month, the Ottawa Heart Institute’s corporate partners matched our $10,000 pledge! This annual event has now raised more than $75,000 for local and international charitable organizations. We can’t wait for our 15th annual breakfast next year! Special thank you to VIA Rail Canada for donating a roundtrip for two, anywhere along their Quebec City- Windsor corridor in Business Class (valued at $2100) for our raffle. 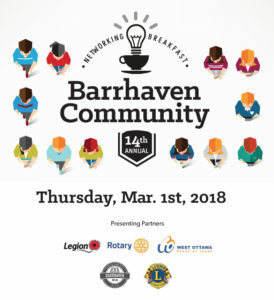 Many thanks to our organizing partners; Barrhaven Lions Club, Barrhaven Legion Branch 641, South Nepean Rotary Club, West Ottawa Board of Trade. MISSED THE BREAKFAST? NO PROBLEM- FIND THE SUMMARY HERE! Minto Communities and Richcraft Homes are initiating an updated to the Barrhaven Town Centre Community Design Plan. As part of this planning exercise, we are hosting a workshop with members of the Barrhaven BIA to offer an opportunity to hear your ideas and input on creating a vibrant town centre in Barrhaven. The workshop will break the participants into a number of small groups centered on key planning and design principles integral to creating a vibrant, town centre where people can live, work and play over the short, medium and long term. Welcome address from City of Ottawa General Manager of Planning, Infrastructure and Economic Development, Mr. Stephen Willis.